TURN YOUR SMARTPHONE OR TABLET INTO A ONE-TOUCH UNIVERSAL REMOTE. Now you can control your entire entertainment system with the smartphone or tablet you already own. The Harmony Hub combined with a powerful app give you personalized control of up to eight devices—even through closed cabinets and walls. Plus, you get a simple Harmony remote for everyone in the house when your smartphone isn’t handy. Replaces multiple remotes. Controls devices you own today and add tomorrow. Harmony Hub turns RF signals from the remote into IR or Bluetooth commands your devices can understand and can’t see—behind closed cabinet doors or walls. Control up to 8 devices including your PS3, Wii or Xbox One, plus your Internet subscription services, like Netflix or Hulu. Harmony supports 270,000 devices from 6,000+ brands, including devices you own today and add tomorrow. 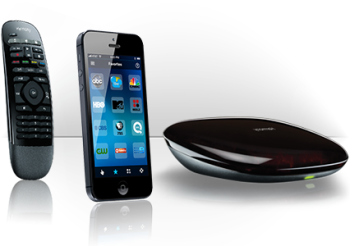 Harmony’s online device library makes it easy to update your smartphone and remote with new devices and commands. Now you can avoid frustrating on-TV keyboards. Use your smartphone/tablet keyboard or speech recognition capability with the Harmony App to find your content faster on Apple TV, Roku or Amazon FireTV. Also works with Windows PCs and Macs. Simply download the Harmony App to your computer or your iPhone 4S or later or Android smartphone with Bluetooth Smart Technology. Screen prompts make it easy to set up your app and remote with commands for your devices. Live customer support is ready to help if you need it. This simple all-button Harmony universal remote gives everyone at home easy control of your entertainment system when your smartphone or tablet isn’t handy. It also works with Harmony Hub for control of devices in closed cabinets.